Amber is the fossilized, hardened resin of the pine tree, Pimus succinifera, formed mainly in the Eocene epoch of the Tertiary period, about 50 million years ago; found mostly in the Baltic coasts of Russia and Poland, and in the Dominican Republic in the Antilles. Other European sources include Czechoslovakia, Romania, and Sicily. It is also found in the United States, Canada, and Chile; and in Myanmar ( Burma). Mostly amber is drop or nodular shaped with a homogeneous structure, or has a shell-like formation, often with a weathered crust. There are occasional inclusions of insects or parts of plants and of pyrites. Its chemical composition varies because it is a mixture of organic compounds, including succinic acid and succinic resins, originating from the polymerization of terpenes and resinous acids. Amber originated from species of now - extinct plants, capable of producing enormous quantities of resin, which fell to the ground or filled large cracks and holes in the trunk and bark. It is sensitive to acids, caustic solutions, and gasoline, as well as alcohol and perfume. Can be ignited by a match, smelling like incense. When rubbed with a cloth, amber becomes electrically charged and can attract small particles. It has a vitreous luster; when it is polished, a resinous luster. The largest deposit in the world is west of Kaliningrad, Russia. Under 100 ft of sand is a 30 ft layer of amber - containing clay , the so-called blue earth. First the amber is washed out, then picked by hand. Only 15 percent is suitable for jewelry. The remainder is used for pressed amber ( Ambroid ) or used for technical purposes. There are large reserves on the seabed of the Baltic. After heavy storms, amber is found on the beaches and in shallow waters of bordering countries. This sea amber is especially solid and used to be regularly fished for by fishermen. Baltic amber is known as succinite, Sicilian as simetite. Amber has been used since prehistoric times for jewelry and religious objects, accessories for smokers, also as amulets and mascots. The Baltic amber, is among the earliest - used gem materials. The name has come down, probably through French, from the Arabic anbar. The Greeks gave amber the name - electrum ( sun made ). The Romans called it succinum, as it was rightly believed to be from the Baltic coast. The distances that had to be covered to obtain it, enormous for those days, give an idea of its importance. THE HISTORIC ROOM AS IT WAS IN 1938.
" The style of the Amber Room of Tsarskoye Selo is a mixture of baroque and rococo, and is a real marvel, not just because of the great value of materials, the elaborate carving and lightness of forms, but principally because of the glorious color of the amber; sometimes dark, sometimes light, but always lending the whole room an inexpressible charm." Thirty - thousand - year - old necklaces and charms testify to the long human fascination with amber, the 'Gold of the North'. Its attraction lasted even into the 18th century. When the Elector of Brandenburg, Frederick III (1657-1713), crowned himself King Frederick I of Prussia in Konigsberg on 18 January 1701, he, too, came to know a passion for the fossilized resin from the shores of the Baltic. That same year, he commissioned the Danish craftsman Gottfried Wolffram to carve an amber chamber for the royal palace at Charlottenburg. Wolffram fell out of favor in 1707, however, and was replaced by the Danzig craftsmen Ernst Schacht and Gotfried Turow, who completed the amber panels by 1711. They were not, as planned, used to grace Charlottenburg Palace but were instead installed in the smoking room of the royal palace in Berlin, where the Russian tsar, Peter I, saw the Amber Room in 1716. He had gone to Berlin to forge an alliance with Frederick's son and successor, Frederick William I ( 1688 - 1740 ), against Charles XII of Sweden. In view of the occasion, the Prussian king gifted the Amber Room to the tsar. The editors of the Correspondenz newspaper, Zacharias Grubel and Franz Herrmann Ortgies, commented at the time: " The degree of understanding between the two rulers may also be judged by the king's presentation to the tsar of two sumptuous gifts: a magnificent and exquisite ship and enough precious amber paneling, itself worth almost thirty thousand imperial thalers, to line a chamber." 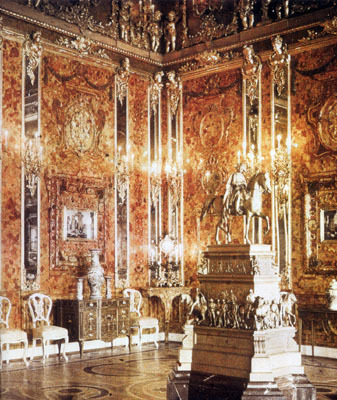 The Amber Room, packed into eighteen crates, was taken by horse and cart to St. Petersburg in April 1717. The crates were at first stored until 1723 - 24 in the old Winter House before being moved to the new Winter Palace. In 1755 tsarina Elisaabeth of Russia ( 1741-62 ) had the amber panels moved south of St. Petersburg to their final destination, the Catherine Palace at Tsarskoye Selo, where the room intended for them was considerably larger than the chamber in Berlin. The court architect Carlo Rastrelli ( 1700-71 ) was given the task of installing the Amber Room and he engaged an Italian, Martelli, and five amber craftsmen from Konigsberg to carve more amber panels. By 1765 they had created a resplendent room in which the original panels alternated with twenty - four Venetian mirrored rectangular columns resting on amber bases. A mirror, mounted in amber, a gift to tsarina Elisabeth from king Frederick II, had also been incorporated in the design. Additionally, four Florentine mosaics embellished the amber walls and gilded rocaille and other carved ornamentation adorned the white doors, while the floor was inlaid with mother -of -pearl, successfully uniting Baroque elements and complementary Rococo features. After the tsarina Catherine II ( 1762-96 ), it was mainly 19th - century society that most admired the Amber Room. A British diplomat described it as the 'eighth wonder of the world', while the chamberlain Friederike Roltsch wrote: " A dark chapter in the story of the Amber Room is incalculable." A dark chapter in the story of the Amber Room opened on 22 June 1941, the day Hitler launched Operation Barbarossa, the invasion of Soviet Union. That same year, German soldiers stormed the opulent rooms of the Catherine Palace. Hans Hunsdorfer, a 'Wehrmacht' captain, described events: " Then I entered the Amber Room, where the walls were covered with thick cardboard. I saw two privates, keen to see what lay behind it, trying to tear down the protective covering. I intervened when they raised their bayonets in an attempt to prize off some mementos. Come the next day, the Amber Room had been ravaged." " An engineer and six privates carefully dismantled the panels over a period of 36 hours and crated them. Dr. Gall, the director general of Berlin's state palaces and gardens, then had them transported to the palace at Konigsberg." The room intended for them there was too small, however, so that the mirrored columns had to be stored in the basement. Until the spring of 1944, the public was again able to view the Amber Room, albeit in a reduced format. Then, on 27 and 29 August 1944, Konigsberg was bombed in allied air-raids and the palace burned to the ground. The Amber Room has now been lost, although its fate has never been established beyond doubt because of contradictory testimonies. Did the Amber Room fall victim to the flames? Was it evacuated in whole or in part? Is it lying in a warehouse in Weimar or Jonastal? The Russians at any rate have abandoned their search for it and have decided instead to rebuild it under the supervision of Professor Alexander Kedrinski and Alexander Shurawljow. Until new facts emerge in the story of the Amber Room, we can only agree with the closing words of German author Heinz G. Konsalik's 1986 novel, Das Bernsteinzimmer ( The Amber Room ): " It's gone, the Amber Room. The walls made of 'sun stone' have ceased to shine and only the sun that made them sparkle knows their fate. But the sun's not saying." In ancient times, amber was not only used for decoration in all forms of carvings, but early doctors prescribed grinding amber into powder and adding water to make a potion for the relief of stomach distresses. Mixed with honey, or oils, it was often prescribed as a salve for various physical pains and injuries. Worn on the body, it was reported to protect health as well as being especially favored as a symptomatic relief for headaches, toothaches, respiratory discomforts, infections and rheumatic pains. Ancient medicine men honored amber as an elixir to heal just about everything except love. Eastern civilizations burned amber for its soothing effects and its disinfectant abilities, for they believed that amber filtered germs by sterilizing an area, especially during childbirth. This honey colored stone radiates powerful amounts of heat and light, and possesses intense magnetic energy. In fact, it is probably the most magnetic stone that we have. That is why amber can be a most effective energy gem. Amber has a low thermal conductivity and feels warm to the touch. This adds to its attraction as a rubbing stone in order to bring out its soothing effects. You might recognize amber as yellow, brown or an orange color, but it does occur in red or cherry orange. Central America and the Caribbean Islands are known for their honey colored amber, while in Baltic, amber is found opaque and in colors of red or yellow. It is one of the softest gems to polish or facet, registering on the Mohs scale # 2.5 to # 3, and it will scratch so easily that attention must be paid to its setting. Rub your amber as well as wear it ! Amber is the blood of the tree, its vital sap. The strength of its tree then transmits to us when we use the stone. Understanding amber means understanding the tree world and that is why this stone will once again become important. Our love of amber is good for the plant world. Amber intensifies our love for the plant and sun world. It enforces our physical processes and cleanses our bodies. It expands the sun and life potential within us and gives us peace. It symbolizes time and teaches us that time is not significant. It helps us to understand better the associations between the human world and the plant world. Be wary of pressed amber ( reconstituted from remnants ) and imitations. Natural - looking pressed amber made from smaller pieces and the remains of the genuine amber. These bits are welded at 284 -482 degrees F and 3000 atmospheres pressure into a substance that can be easily mistaken for natural amber. Among the many amber imitations, perhaps the most convincing is copal resin. This is a 'young' resin compared with amber, and is derived from various tropical trees. It is mainly used as the basis for copal varnish. Because it has a similar SG to amber (1.08), it cannot be distinguished from it by hydrostatic weighing or immersion techniques. Unlike amber, however, copal softens in ether, and a small drop of the liquid will leave a dull spot on its surface. Copal also crumbles easily under a knife blade ( or even under thumbnail pressure ). When fractured, its surface has a characteristic crazed network of fine cracks. Small dead insects have been inserted into molten copal resin in an attempt to deceive. kauri tree in New Zealand's North Island ). Like copal resin, it is generally a younger material than amber, although fossil kauri gum also exists. The younger gum is more soluble in ether than amber, but the fossil gum may pass this test. Glass imitations of amber are easy to detect because of their hardness, and glass can also be separated from amber because it is colder to the touch.